ZYLINDERKOPFDICHTUNG SATZ OPEL Corsa A B 1,2i C12NZ X12SZ TOP Qualität!! CHEVROLET ALERO V6 GASOLINA 3350cc 173/177hp LA1(207CID) (3/1999-). CHEVROLET IMPALA V6 GASOLINA 3350cc 182hp LA1(207CID) (1/1999-2005). CHEVROLET EQUINOX LS V6 GASOLINA 3350cc LNJ (2005-2008). CHEVROLET EQUINOX LT V6 GASOLINA 3350cc LNJ (2005-2008). CHEVROLET LANOS GASOLINA 1349cc 75hp A14SMS SOHC/OHC (5/1997-). CHEVROLET LANOS SEDAN GASOLINA 1349cc 75hp A14SMS SOHC/OHC (5/1997-). DAEWOO LANOS GASOLINA 1349cc 75hp A14SMS SOHC/OHC (5/1997-). DAEWOO LANOS SEDAN GASOLINA 1349cc 75hp A14SMS SOHC/OHC (5/1997-). Our Part No's / OE PART NUMBER VAP054HBS. ElringKlinger AG. CHEVROLET ZAFIRA (F75) 2.0 04.01 - 07.12 100 136. OPEL ANTARA (L07) 2.4 05.06 104 141 0035-AFV. OPEL ANTARA (L07) 2.4 4x4 01.07 103 140. OPEL ANTARA (L07) 2.4 09.08 103 140 0035-AJA. Genuine Chevrolet Cruze 1.8/1.6 Cylinder Head Oil Plug x 2 - Part number is 11095513.Size is M10 x 1 x 8 . Its item number 222 in the last picture. These are brand new but they are part of a multi pack so when sold it will be sent in non original packaging. Please take a look at my other items. Thanks for looking. CHEVROLET SPARK 1.0 Cylinder Head Bolts 2005 on Set Kit BGA. CHEVROLET SPARK 1.0 SX Hatchback Petrol 05/2005 on FWD 8 63 46. 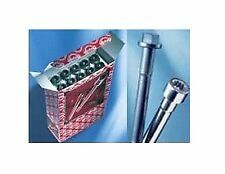 Function Bolt Kit, cylinder head. CHEVROLET 94580081x10. CHEVROLET KALOS 1.2 Hatchback Petrol 03/2005 on FWD 8 72 53. ElringKlinger AG. Seit vielen Jahren steht die Traditionsmarke „Elring – Das Original“ für ein Höchstmaß an Qualität, Sicherheit und Verlässlichkeit. OPEL ZAFIRA B Van (A05) 1.6 CNG Turbo (M75) 02.09 110 150 0035-AQN. CHEVROLET 94580081, 945800818X. GENERAL MOTORS 945800818X. Engine Code: F8CV. CHEVROLET MATIZ (M200, M250) 0.8 Hatchback Petrol 03/2005 on FWD 6 52 38. CHEVROLET MATIZ (M200, M250) 0.8 Hatchback Petrol 10/2010 on FWD 6 50 37. Thread Pitch 1 1.25 mm. Function Bolt Kit, cylinder head. Thread Size M10. CHEVROLET NUBIRA Saloon 1.4 Saloon Petrol 01/2006 12/2008 FWD 16 95 70. CHEVROLET NUBIRA Estate 1.6 Estate Petrol 03/2005 12/2011 FWD 16 109 80. Compatible Engine CodesF14D3, L14, L95, A16DMS, F16D3, LXT, L91, F14D5, A15MF, 98CID. CHEVROLET GENTRA 16V GASOLINA 1598cc 105hp F16D3 DOHC (5/2005-12/2005). CHEVROLET GENTRA SEDAN 16V GASOLINA 1598cc 105hp F16D3 DOHC (5/2005-12/2005). CHEVROLET ORLANDO (J309) 2.0 D MPV Diesel 02/2011 on FWD 16 131 96. CHEVROLET ORLANDO (J309) 2.0 D MPV Diesel 02/2011 on FWD 16 163 120. CHEVROLET CRUZE Station Wagon (J308) 2.0 TD Estate Diesel 08/2012 on FWD 16 163 120. CHEVROLET CRUZE Hatchback (J305) 1.6 Hatchback Petrol 01/2012 on FWD 16 109 80. Engine Code: LXT. CHEVROLET CRUZE (J300) 1.6 Saloon Petrol 05/2009 on FWD 16 109 80. Thread Pitch 1 1.25 mm. Function Bolt Kit, cylinder head. CHEVROLET MATIZ (M200, M250) 0.8 Hatchback Petrol 03/2005 on FWD 6 52 38. Function Bolt Kit, cylinder head. CHEVROLET 96416362. CHEVROLET KALOS Hatchback (T250, T255) 1.2 Hatchback Petrol 04/2008 on FWD 16 84 62. GM-CHEVROLET ZAFIRA A 16V GASOLINA 1796cc 115hp Z18XE1 DOHC (1999-2001). GM-CHEVROLET ASTRA 16V GASOLINA 1796cc 115hp Z18XE1 DOHC (1998-). GM-CHEVROLET ASTRA G 16V GASOLINA 1796cc 115hp Z18XE1 DOHC (2/1998-9/2000). CHEVROLET ORLANDO 16V GASOLINA 1796cc 141hp 2H0 DOHC (2/2011-). CHEVROLET CRUZE LPG 16V GASOLINA 1796cc 141hp 2H0 DOHC (6/2011-). CHEVROLET CRUZE SW 16V GASOLINA 1796cc 141hp 2H0 DOHC (8/2012-). CHEVROLET CRUZE 16V GASOLINA 1796cc 141hp 2H0 DOHC (5/2009-). Engine Code: LXT. ; Also fits:- ;Engine Code: A16DMS. Engine Code: A16DMS. CHEVROLET VIVANT 1.6 MPV Petrol 08/2001 on FWD 16 106 78. CHEVROLET VIVANT 1.6 MPV Petrol 01/2005 on FWD 16 105 77. Thread Pitch 1 1.25 mm. Thread Pitch 1 1.5 mm. Function Bolt Kit, cylinder head. Thread Size M12. CHEVROLET NUBIRA Estate 2.0 D Estate Diesel 01/2007 12/2011 FWD 16 121 89. CHEVROLET NUBIRA Saloon 2.0 D Saloon Diesel 01/2005 12/2011 FWD 16 121 89. Engine Code: LXT. ; Also fits:- ;Engine Code: A16DMS. Engine Code: A16DMS. Thread Pitch 1 1.25 mm. Function Bolt Kit, cylinder head. Thread Size M10. CHEVROLET LANOS Saloon 1.6 16V Saloon Petrol 11/2005 on FWD 16 106 78. Engine Code: Z20DM; Camshaft pos. : SOHC/OHC; Model year to: 12/2010. Engine Code: Z20DM. Engine Code: Z20DM; Engine Code: Z20S. CHEVROLET LACETTI (J200) 2.0 D Hatchback Diesel 01/2007 on FWD 16 121 89. CHEVROLET 5094005027, 94501031. CHEVROLET AVEO / KALOS Hatchback (T200) 1.4 16V Hatchback Petrol 03/2005 05/2008 FWD 16 94 69. CHEVROLET AVEO / KALOS Hatchback (T200) 1.6 Hatchback Petrol 09/2003 12/2007 FWD 16 105 77. Engine Code: LUD. CHEVROLET CRUZE (J300) 1.7 D Saloon Diesel 01/2012 on FWD 16 131 96. CHEVROLET CRUZE Hatchback (J305) 1.7 D Hatchback Diesel 01/2012 on FWD 16 131 96. CHEVROLET CRUZE Station Wagon (J308) 1.7 TD Estate Diesel 08/2012 on FWD 16 131 96. Thread Pitch 1 1.25 mm. Function Bolt Kit, cylinder head. Thread Size M10. CHEVROLET 9458008110X. Bolt Head/Nut Design Hexagon Collar. CHEVROLET AVEO / KALOS Hatchback (T200) 1.2 Hatchback Petrol 01/2004 05/2008 FWD 8 72 53. Compatible Engine CodesB12D1, LMU, 73CID, B10D1. CHEVROLET SPARK LT 16V GASOLINA 1206cc 82hp LMU DOHC (2013-). CHEVROLET SPARK LTZ 16V GASOLINA 1206cc 82hp LMU DOHC (2013-). CHEVROLET SPARK ZMX 16V GASOLINA 1206cc 82hp LMU DOHC (2013-). Engine Code: F16D3. Engine Code: LXT. ; Also fits:- ;Engine Code: F16D3. CHEVROLET LACETTI (J200) 1.4 16V Hatchback Petrol 03/2005 on FWD 16 95 70. CHEVROLET LACETTI (J200) 1.6 Hatchback Petrol 03/2005 on FWD 16 109 80. Engine Code: Z20S. Engine Code: Z20DMH; Engine Code: Z20S. Engine Code: Z20DM; Engine Code: Z20S. Thread Pitch 1 1.5 mm. Function Bolt Kit, cylinder head. Thread Size M12. CHEVROLET CRUZE (J300) 2.0 CDI Saloon Diesel 05/2009 on FWD 16 150 110. DAEWOO 94501031x10. Engine Code: F16D3; Engine Code: LXT. Engine Code: F16D3; Model year to: 03/2005. Engine Code: F16D3. Thread Pitch 1 1.25 mm. Function Bolt Kit, cylinder head. Thread Size M10. CHEVROLET NUBIRA Saloon 1.4 Saloon Petrol 01/2006 12/2008 FWD 16 95 70. CHEVROLET OPTRA (1J_) 1.6 Saloon Petrol 08/2003 12/2008 FWD 16 106 78. CHEVROLET OPTRA (1J_) 1.6 Saloon Petrol 08/2003 12/2008 FWD 16 109 80. CHEVROLET OPTRA (1J_) 1.6 CNG Saloon Petrol/Natural Gas (CNG) 03/2005 12/2010 FWD 16 109 80. CHEVROLET 0910310056, 5094005027, 94501031. DAEWOO 0910310056, 5094005027, 910310056, 94501031. CHEVROLET CRUZE (J300) 1.6 Saloon Petrol 05/2009 on FWD 16 124 91. CHEVROLET CRUZE (J300) 1.6 Saloon Petrol 05/2009 on FWD 16 109 80. Engine Code: F14D3. Engine Code: F14D3; Engine Code: L14. CHEVROLET AVEO / KALOS Hatchback (T200) 1.4 16V Hatchback Petrol 03/2005 05/2008 FWD 16 94 69. CHEVROLET KALOS Saloon (T250, T255) 1.4 Saloon Petrol 03/2005 12/2007 FWD 16 94 69. CHEVROLET AVEO / KALOS Hatchback (T200) 1.4 16V Hatchback Petrol 03/2005 05/2008 FWD 16 94 69. CHEVROLET AVEO / KALOS Hatchback (T200) 1.6 Hatchback Petrol 09/2003 12/2007 FWD 16 105 77. CHEVROLET AVEO / KALOS Saloon (T200) 1.4 Saloon Petrol 05/2003 01/2007 FWD 16 94 69. Engine Code: F14D3. Engine Code: L14. ; Also fits:- ;Engine Code: F14D3. CHEVROLET AVEO / KALOS Hatchback (T200) 1.4 16V Hatchback Petrol 03/2005 05/2008 FWD 16 94 69. CHEVROLET AVEO / KALOS Hatchback (T200) 1.6 Hatchback Petrol 09/2003 12/2007 FWD 16 105 77. CHEVROLET TACUMA MPV (U100) 2.0 MPV Petrol 03/2005 on FWD 16 121 89. CHEVROLET TACUMA MPV (U100) 2.0 MPV Petrol 08/2005 on FWD 16 122 90. DAEWOO TACUMA (U100) 2.0 MPV Petrol 09/2001 on FWD 16 121 89. Function Bolt Kit, cylinder head. CHEVROLET 11117A78B00, 11117A78B00000, 17A78B00, 94580081. DAEWOO 11117A78B00, 11117A78B00000, 17A78B00, 94580081. CHEVROLET MATIZ (M200, M250) 1.0 Hatchback Petrol 03/2005 on FWD 8 64 47. CHEVROLET MATIZ (M200, M250) 1.0 Hatchback Petrol 03/2005 on FWD 8 67 49. CHEVROLET EPICA 24V GASOLINA 1993cc 145hp Z20XED DOHC (2006-2011). DAEWOO EPICA 24V GASOLINA 1993cc 145hp Z20XED DOHC (2/2006-2011). CHEVROLET EPICA 24V GASOLINA 2492cc 156hp Z25SED DOHC (6/2006-2011). CHEVROLET LACETTI (J200) 1.8 Hatchback Petrol 03/2005 on FWD 16 122 90. CHEVROLET LACETTI Estate (J200) 1.8 Estate Petrol 08/2005 on FWD 16 121 89. Function Bolt Kit, cylinder head. CHEVROLET 90466480, EC90466480. Engine Code: F12S3. Engine Code: B12S1. ; Also fits:- ;Engine Code: F12S3. CHEVROLET AVEO / KALOS Hatchback (T200) 1.2 Hatchback Petrol 01/2004 05/2008 FWD 8 72 53. Thread Pitch 1 1.25 mm. Function Bolt Kit, cylinder head. CHEVROLET MATIZ (M200, M250) 1.0 Hatchback Petrol 03/2005 on FWD 8 64 47. CHEVROLET MATIZ (M200, M250) 1.0 Hatchback Petrol 03/2005 on FWD 8 67 49. CHEVROLET MATIZ (M200, M250) 1.0 LPG Hatchback Petrol/Petroleum Gas (LPG) 03/2005 on FWD 8 67 49. ElringKlinger AG. Seit vielen Jahren steht die Traditionsmarke „Elring – Das Original“ für ein Höchstmaß an Qualität, Sicherheit und Verlässlichkeit. OPEL ZAFIRA TOURER C (P12) 1.4 (75) 10.11 103 140 0035-ATB. CHEVROLET 9458008110X. GENERAL MOTORS 9458008110X. CHEVROLET AVEO / KALOS Hatchback (T200) 1.2 Hatchback Petrol 01/2004 05/2008 FWD 8 72 53. CHEVROLET KALOS Saloon 1.2 Saloon Petrol 03/2005 on FWD 8 72 53.